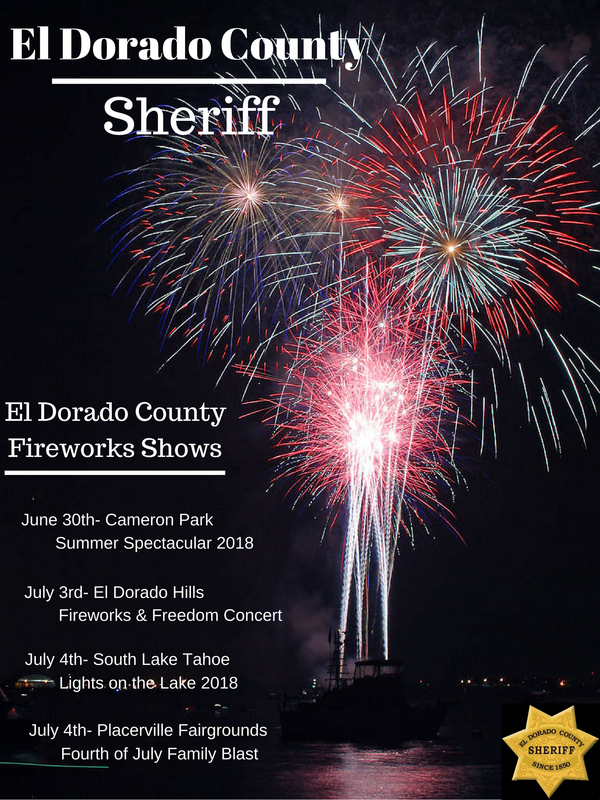 With the Fourth of July fast approaching, the El Dorado County Sheriff’s Office wants to remind everyone that fireworks of any kind are illegal in El Dorado County. Any person caught possessing, transporting, purchasing, selling, or even storing fireworks could be cited or arrested and booked into the El Dorado County Jail for violating the misdemeanor county ordinance. Illegal fireworks in El Dorado County even include sparklers or those sold in Sacramento County as “Safe and Sane”. All fireworks will be confiscated as evidence, rendered safe, and properly disposed of. According to the National Fire Protection Association, thousands of people, most often children and teens, are injured while using consumer fireworks every Fourth of July. Despite the danger, few people understand or respect the associated risks such as devastating burns, sever injuries to eyes ears and extremities, structure fires, wild land fires and even death. Yet many who use illegal fireworks do so without fear of repercussions or consequences. Please had a fun and safe holiday weekend in El Dorado County, without the fear of fire or injury. Pyrotechnics can be enjoyed by the whole family at several venues to include in Cameron Park on June 30th, El Dorado Hills Town Center on July 3rd, and the El Dorado County Fairgrounds and South Lake Tahoe on July 4th. Please make your celebration a safe one without endangering yourselves or your neighbors. Safety should be paramount for everyone. There is a lot to celebrate of Independence Day, so have fun and stay safe! If you see others using fireworks, please report it to law enforcement immediately. You may be saving someone’s life, home, neighborhood, or our forest lands. Early this morning, The El Dorado County Sheriff’s Office was dispatched to multiple reports of criminal activity in the Serrano Community. There were numerous calls by residents about possible domestic violence involving the brandishing of a firearm and possibly associated with vehicle burglaries. During the course of this investigation, a deputy and his K9 partner were used to track and search for the wanted person who was believed to be armed. Information on this call was released in an earlier press release on 6-19-18. During the search, deputies contacted a homeowner and advised they would be searching their backyard. While deputies and the K9 were searching the property, the homeowner opened an exterior door to the backyard. The EDSO K9 alerted on that motion and bit the homeowner causing injuries. Today, June 19th, 2018, at about 0649 hours, the El Dorado County Sheriff’s Office was dispatched to multiple criminal allegations in the Serrano Community, near Villagio Drive. The El Dorado County Sheriff’s Office was originally called by multiple members of the community regarding multiple, and various, descriptions of crimes. These included possible domestic violence involving the brandishing of a black handgun, and possibly associated with vehicle burglaries. With multiple callers and information providing different and sometimes conflicting reports, our response was made to insure the community safety. Upon arrival, a man matching the suspect’s description fled on foot from EDSO deputies into neighboring backyards. After a thorough investigation on scene, it was ultimately determined that original described suspect had been see breaking into vehicles. This suspect was then confronted by a homeowner with a firearm. All of this was viewed and reported by additional community members. At the same time this was learned by EDSO, it was determined that the suspected burglar was hiding in a house on Archetto Dr. Once this information was determined, the call was downgraded from an armed suspect to a vehicle burglary investigation. EDSO deputies and detectives continued to work the case, identifying 18 year old Brandon Rupchock as the suspected vehicle burglar. Brandon is in EDSO custody and there are no additional outstanding subjects regarding this investigation. EDSO takes the safety of our community seriously and we thank you for your patience during the investigation.